We get our first look at the upcoming collaboration between Ice-T and Vans Syndicate for the Sk8-Hi. Back in the day before he was a cop on Law And Order, Ice-T was a "cop killer" and one of the pioneers of gangster rap. Vans Syndicate (there just so happens to be a song on his second album Power titled The Syndicate") teams up with the O.G. this Fall for a two-shoe pack containing both the Chukka Decon "S" and Sk8-Hi "S", the latter which we get our first look at below. The Ice-T Sk8-Hi "S" features a clean and simple black and white suede/canvas construction with multiple counts of branding to let you know these aren't just anybody's pair of Sk8-Hi's. 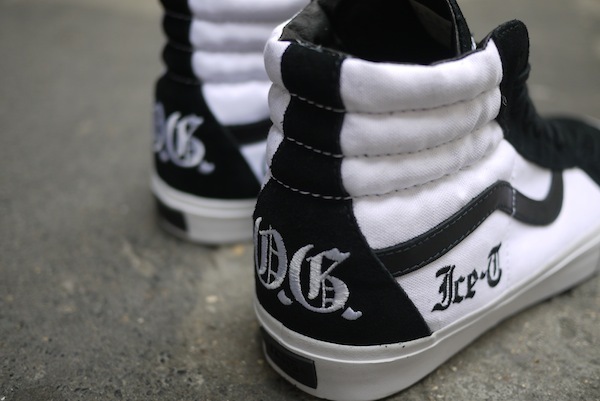 Across the shoe you'll see "O.G" at the heels, "Ice-T" on each lateral side and "RHYME" on the tongue, each in Old English for a traditional G'd out look. Expect this Sk8-Hi "S" and the rest of the Vans Sydicate x Ice-T Capsule Collection on September 15th.